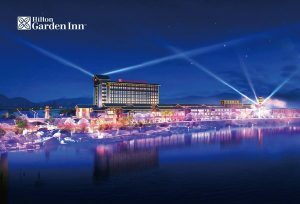 Hilton and Hilton Garden Inn today announced the opening of Hilton Garden Inn Nujiang in Yunnan province. The new focused-service hotel is the first and only international hotel in Nujiang, offering a premium choice for the region’s business and leisure travelers with its award-winning service and brighthearted hospitality. The property is owned by Nujiang Zhengge Hotel Management Co., Ltd, and managed by Hilton. Hilton Garden Inn Nujiang is conveniently located in the heart of Nujiang, surrounded by a variety of recreational facilities. The hotel not only connects to a new airport just 10 kilometers away, but also provides easy access to the stunning Nujiang Grand Canyon, one of Yunnan’s most sought-after attractions. Nujiang’s largest shopping malls, entertainment centers and local restaurants are also just a quick stroll away from the hotel. Light and airy spaces set the stage for an intuitive level of care and heartfelt service. The hotel is also designed to incorporate elements of local Lisu culture through the building’s traditional pitched roof structure and use of crimson-colored elements throughout the hotel’s design. Guests can enjoy room service or a selection of freshly made food and drinks at the hotel’s all-day-dining restaurant, a Chinese noodle bar, and convenience shop. The Garden Grille & Bar® is the hotel’s all-day-dining, serving breakfast, lunch and dinner within a modern and sophisticated environment. Guests can also recharge with a coffee or tea at the restaurant bar or unwind over stylish cocktails in the evening. For authentic local cuisine, The Noodle Bar® offers a mouthwatering selection of noodle dishes that will appeal to every taste. The Pavilion Pantry® is a 16-hour grab-and-go outlet which offers a variety of food and beverage options for guests on the go. All 205 elegant guest rooms and suites are designed with the perfect balance of comfort and style, with more than half of the rooms offering stunning views of the Nujiang Grand Canyon. Each room is equipped with lush, comfortable bedding, a 43-inch LED TV, a work desk with ergonomic chair, and a mini refrigerator. Complimentary high-speed Wi-Fi access is available throughout the hotel, and 24-hour self-service laundry facilities provide added convenience. Guests seeking exercise around the clock can enjoy the 24-hour fitness center onsite. The hotel also offers Digital Key, which allows Hilton Honors members to check-in, choose and access their room via the Hilton Honors mobile app. Hilton Garden Inn Nujiang also meets the needs of business meetings and social gatherings of most sizes. The 120-square-meter meeting room, which accommodates up to 80 guests, is equipped with advanced audio-visual equipment, high-speed network and a dedicated service team that caters to guests’ needs. Hilton Honors is the award-winning guest loyalty program for Hilton’s 15 world-class brands comprising more than 5,500 properties with nearly 895,000 rooms, in 109 countries and territories. Hilton Honors members who book directly through preferred Hilton channels have access to instant benefits, including a flexible payment slider that allows members to choose nearly any combination of Points and money to book a stay, an exclusive member discount that can’t be found anywhere else, and free standard WiFi. To celebrate the hotel’s opening, Hilton Honors members will earn an additional 1,000 Points per night when booking directly with Hilton before June 30th, 2019. Hilton Garden Inn Nujiang is located at No.1 Nujiang West Coast, Liuku Town Lushui City, Nujiang Continent Yunnan Province, China, 673200.